Then it was off to Shanghai! Shanghai is Las Vegas on steroids. I love the bright lights of Vegas and the really phenomenal opportunities to people-watch; Shanghai ups that astronomically. 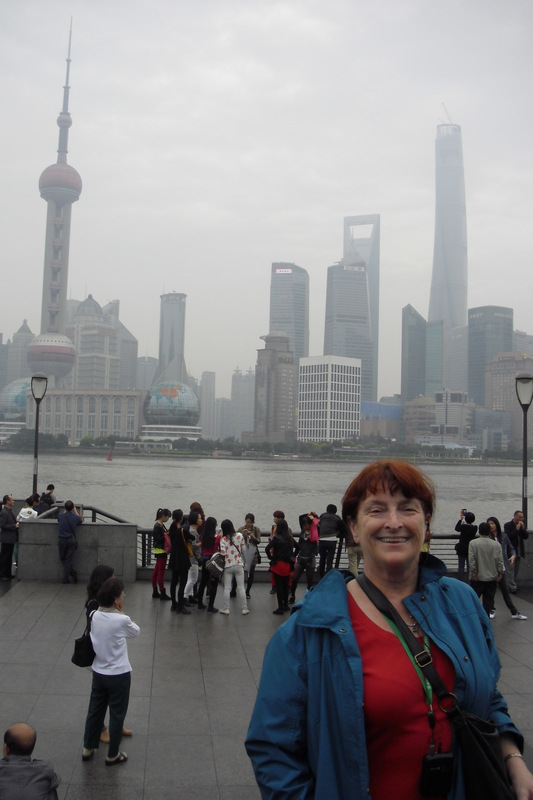 I counted 27 languages during a half-hour stroll on the Bund. 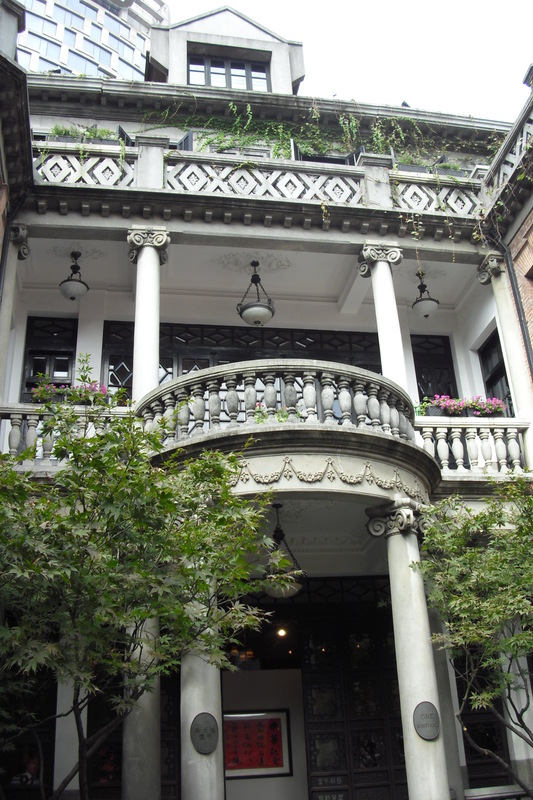 The Bund is also the boundary of the French Concession. 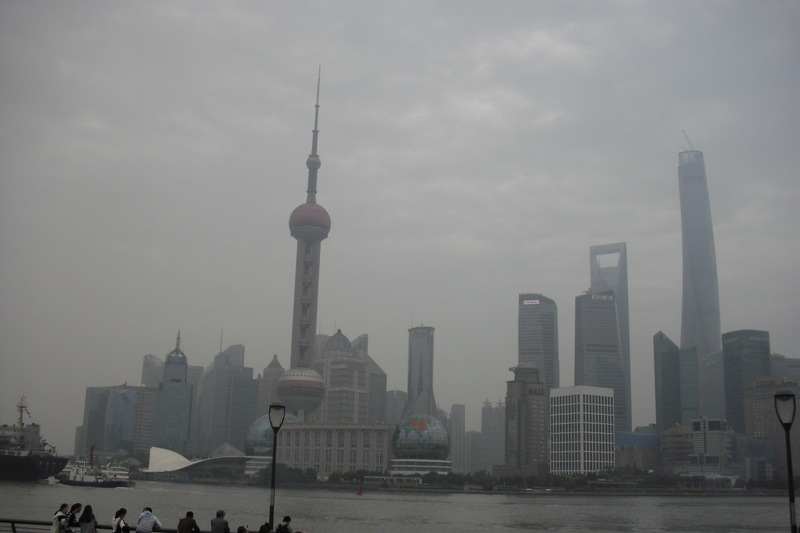 In the 1800s, Shanghai was subdivided into territories (concessions) allotted to foreign interests. If you didn’t know you were in China, you could easily think of yourself in the back streets of Paris. 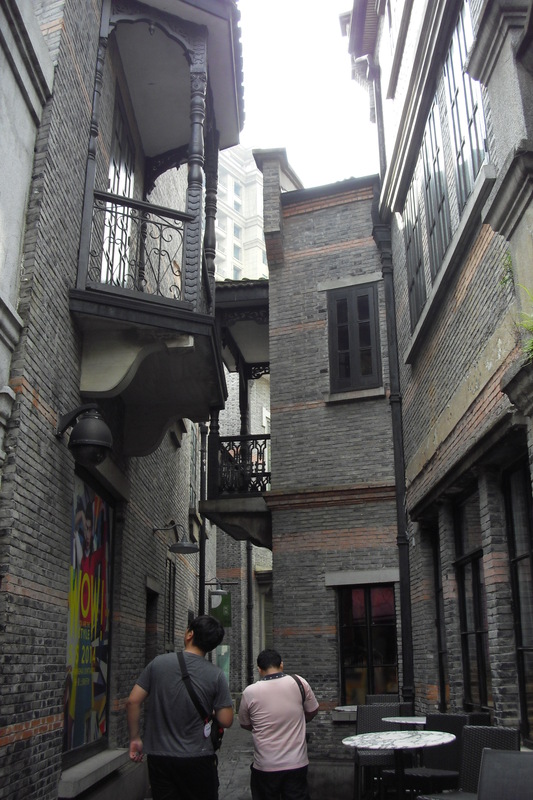 Although during the Cultural Revolution a good many of the stately old buildings were torn down, efforts are now being made to restore and retain the historically significant buildings of the concessions. 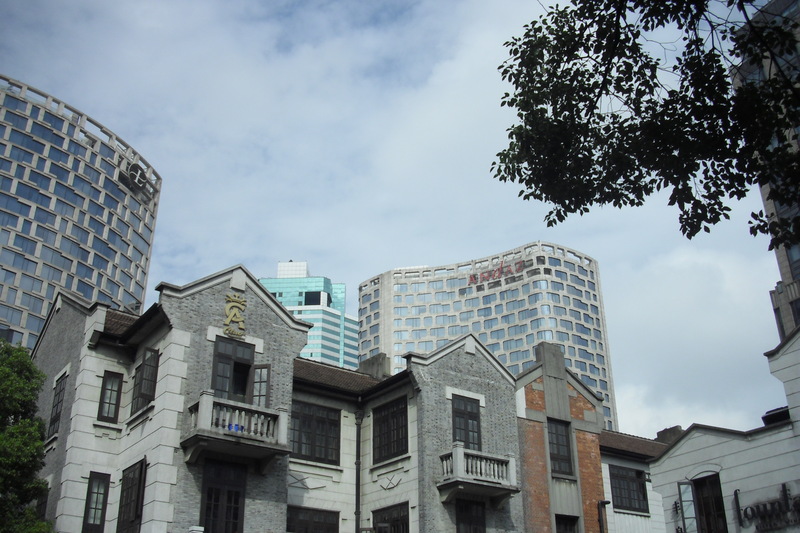 The incongruity of the quaint old mansion and the new high-rise office building was appealing. 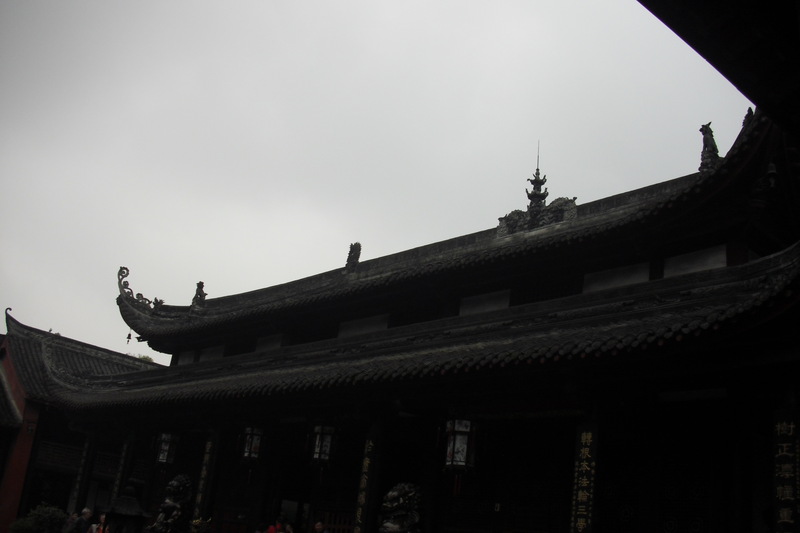 We also visited what the guide told us was the oldest Buddhist temple in the Sichuan province. And the evening meal was an authentic Sichuan hot pot – really delicious although a good many of our group thought it was way too spicy. Not. 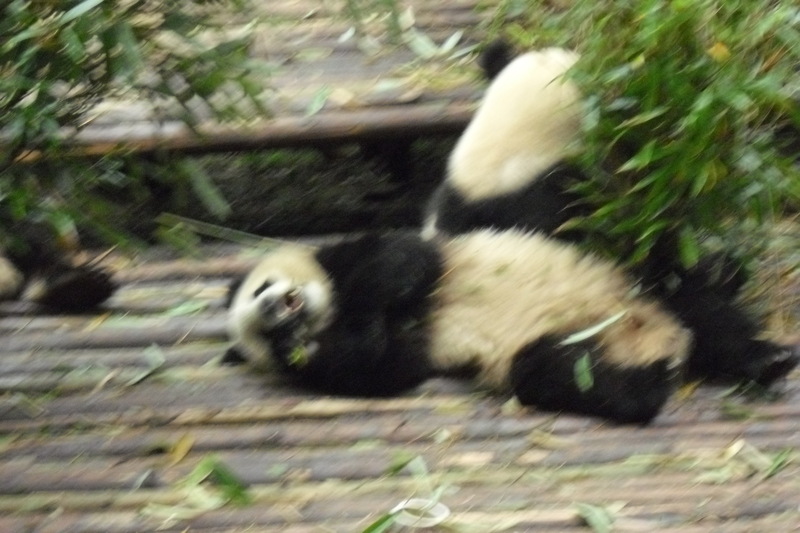 to Chengdu, which is the location of the International Panda preserve. 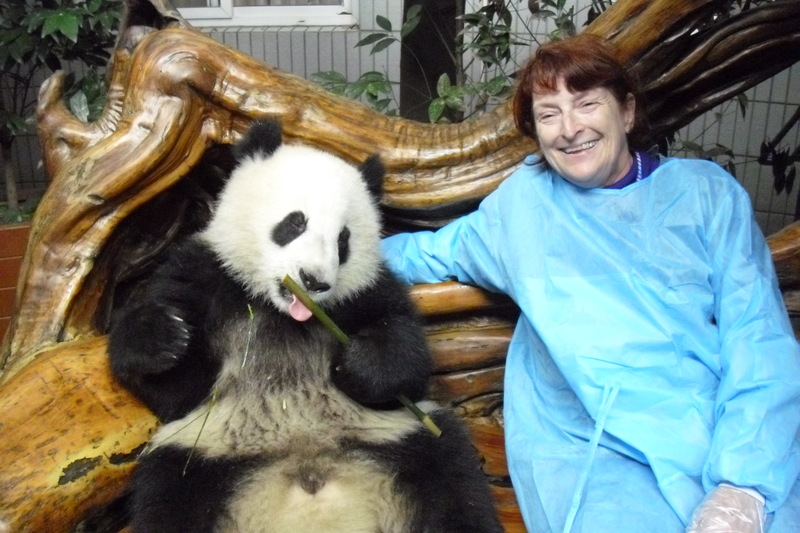 The site is huge, essentially old-growth forest that has been turned over to the protection and breeding of giant and red pandas. Red pandas, incidentally, are not bears; they are closely related to the raccoon! And I got to get close-up and personal with a yearling cub. The most mind-blowing item on a mind-blowing tour was the realization that all – each and every one – of these statutes had been, at one time, painted. And not with pastels, either. 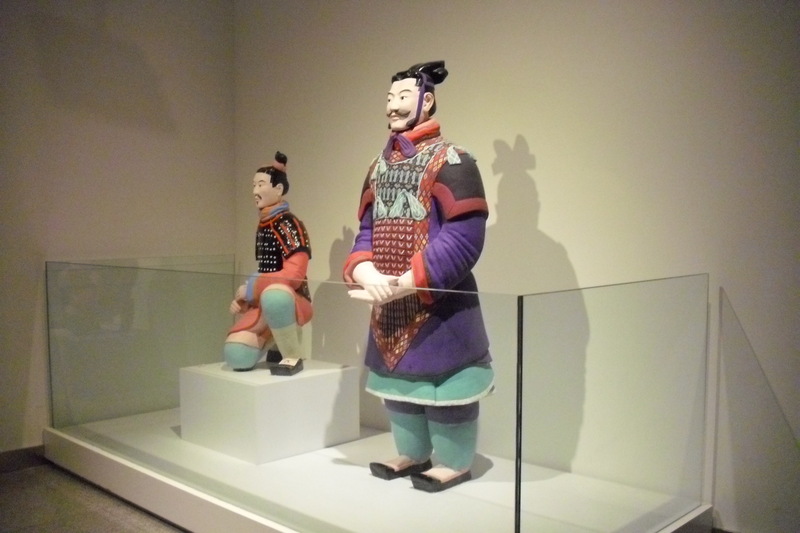 This is an artist’s reconstruction of the paint on one of the statues (there are traces of color on many of them, and this is what the artist felt that it would have looked like originally). Imagine acres and acres and thousands and thousands of these statues in these colors! The eyes can’t take it all in and the mind refuses to believe. Would have been something to see! I came close to the same color pattern, didn’t I! The Army wouldn’t be complete without its cavalry, would it! What I found remarkable was that they were life-size. 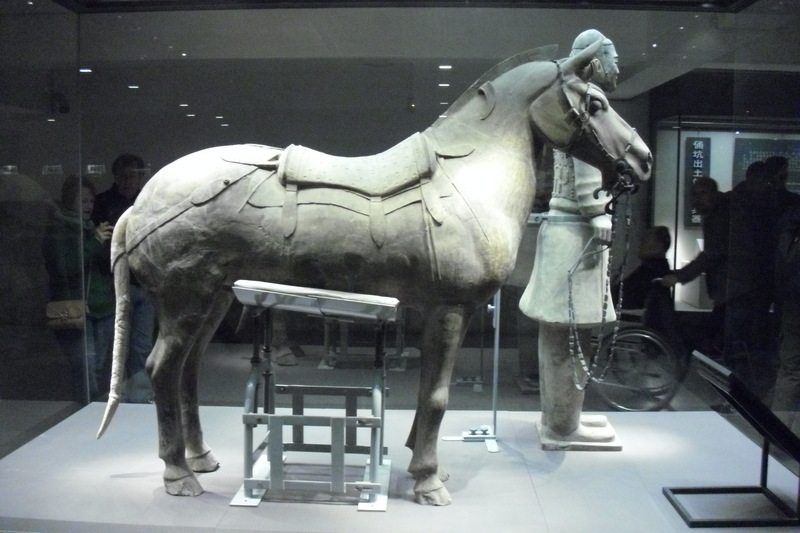 Remember that these are most likely steppe ponies circa 221BC, and this is a perfectly reasonable size for the time. 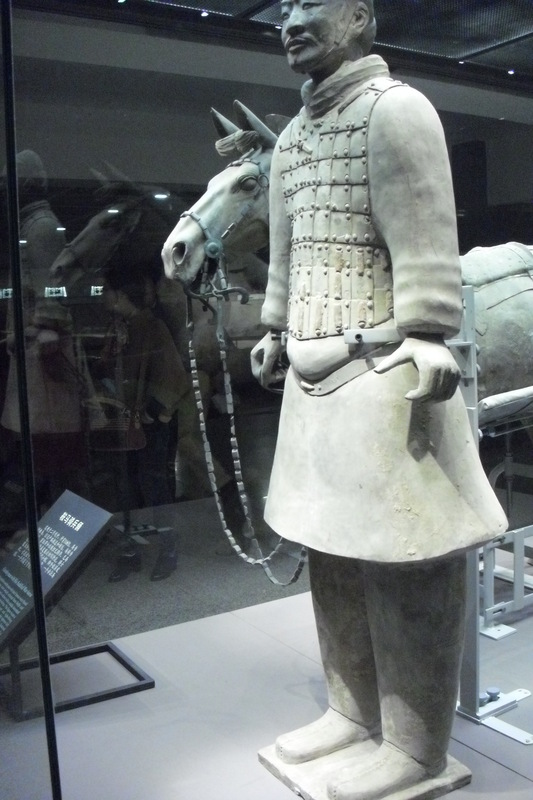 The cavalryman is about 5’5″. 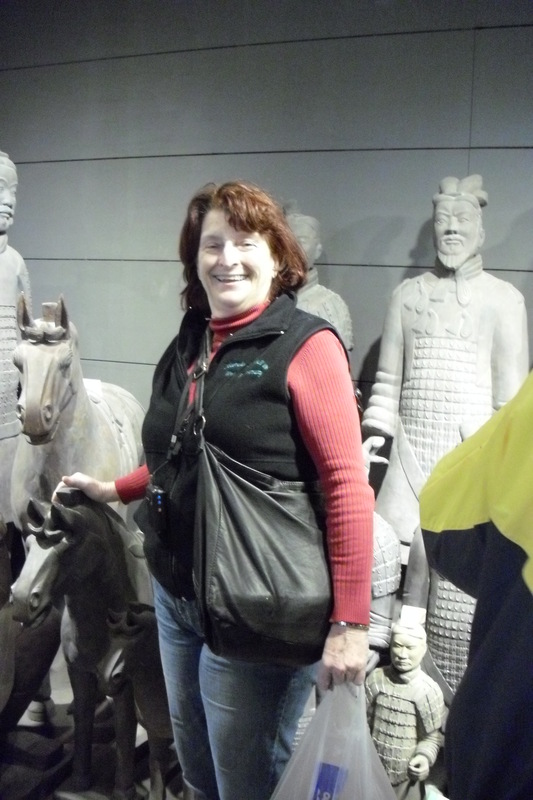 The museum on the site (by the way, it appears that the archeologists have about 150 years of digging left to do – there are acres and acres that have not yet been touched) has some of the finest pieces on display. This dude is an archer (fragments of bow were found at his feet and you can imagine him positioning himself. And this guy was a senior officer. What I found fascinating was that you could actually tell this fellow was senior to the other one, both by the look on his face and by his dress. What fascinated me was the “hospital” for the statues. 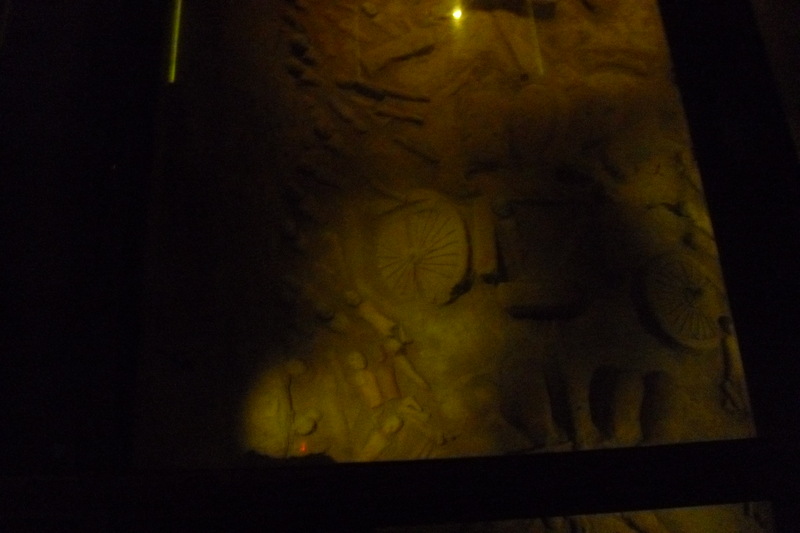 When the Army was created, the builders made a wooden roof to cover it up, and then buried the roof. 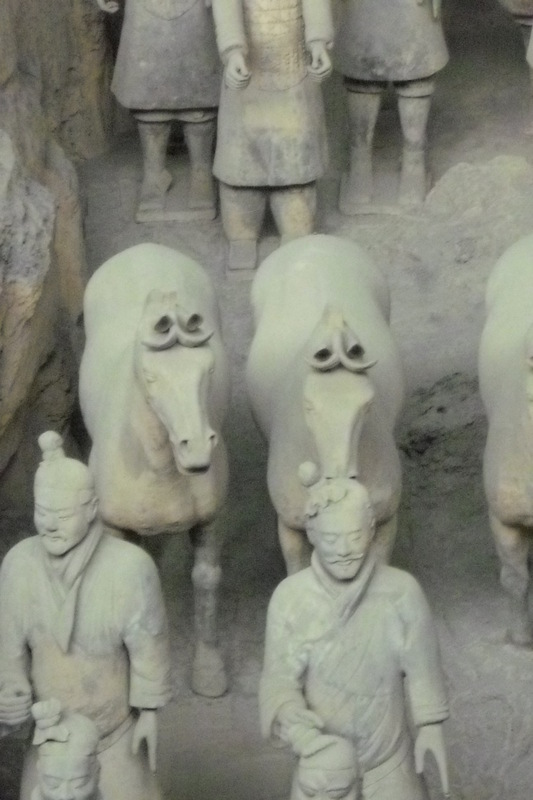 Remember that this was a funerary army, not meant for public display. It’s a great emperor who goes to his grave with this kind of army! Unfortunately, over time the wood of the roof rotted and collapsed, crushing the terra cotta figures beneath. 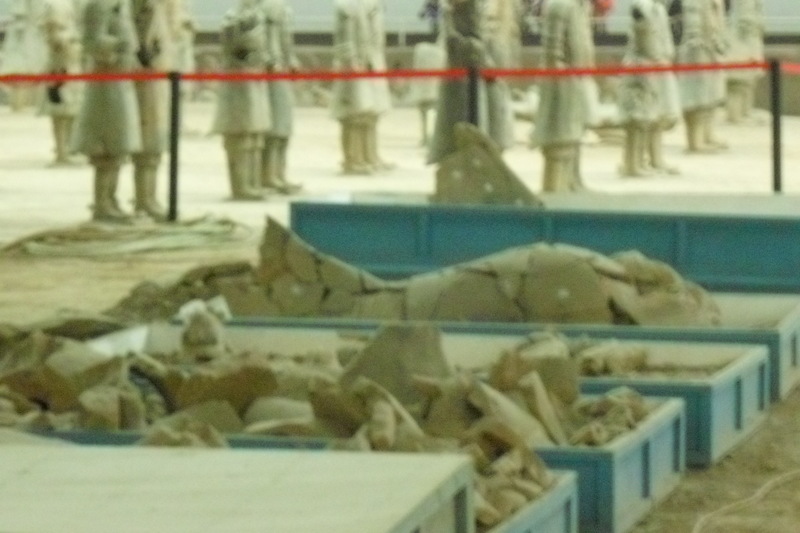 The pieces, fortunately, lie in situ, so that by careful excavation, the workers can recover the majority of each statue’s fragments. They use spectography to determine which piece of which statue goes where (apparently they can read these things – amazing what computers can do!) and painstakingly rebuild the broken statues. This was the day I was waiting for, and I must admit that it made the whole trip. 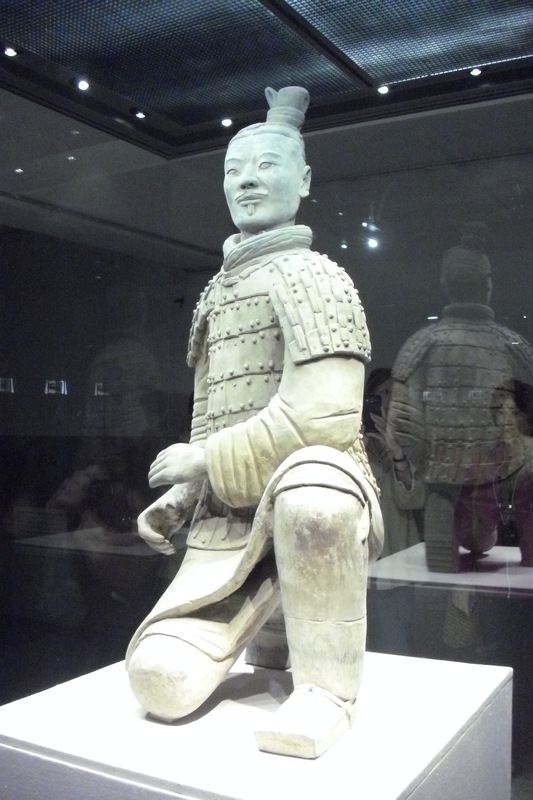 Qin Shi Huangdi dies: 210BC, at age 50. Quite a lot to have achieved in a short period, no? 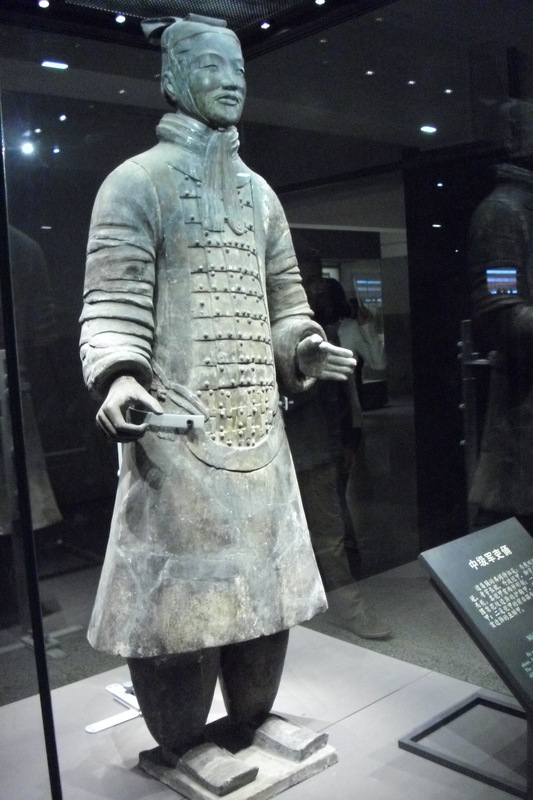 Qin Shi Huangdi was given a burial in keeping with his accomplishments. His tomb (see yesterday’s post) is rumored to have been filled with rare and precious objects, and guarded by a cordon of automatic cross-bow mechanisms to shoot anyone attempting to break in. The site has always been known (kinda hard to miss) but oddly enough has remained intact. 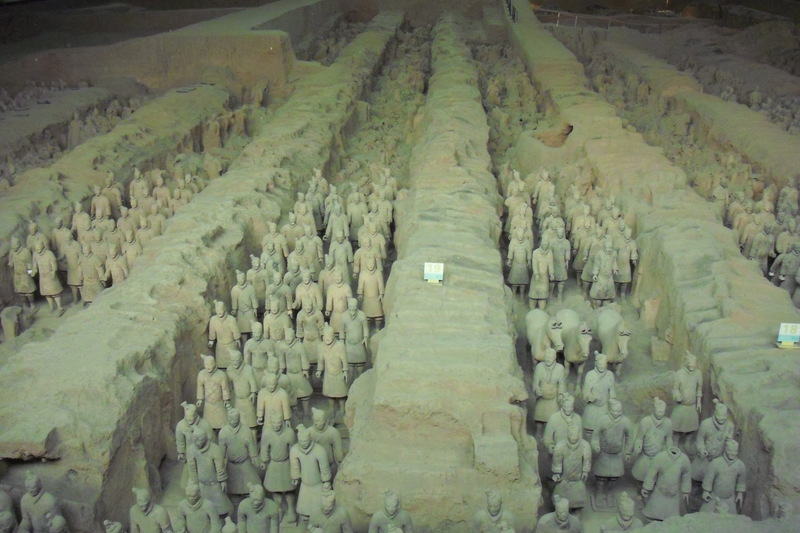 In 1974, while digging a well, a group of peasants came across the first of the terra cotta statues which make up the Terra Cotta Army. The plaque lower right is the site of the original well. The site is mind-boggling. Thousands of soldiers stand at attention. There are acres and acres of statues. There are distinct branches of the army: there are archers, lancers, swordsmen, cavalry. And they go on and on and on. 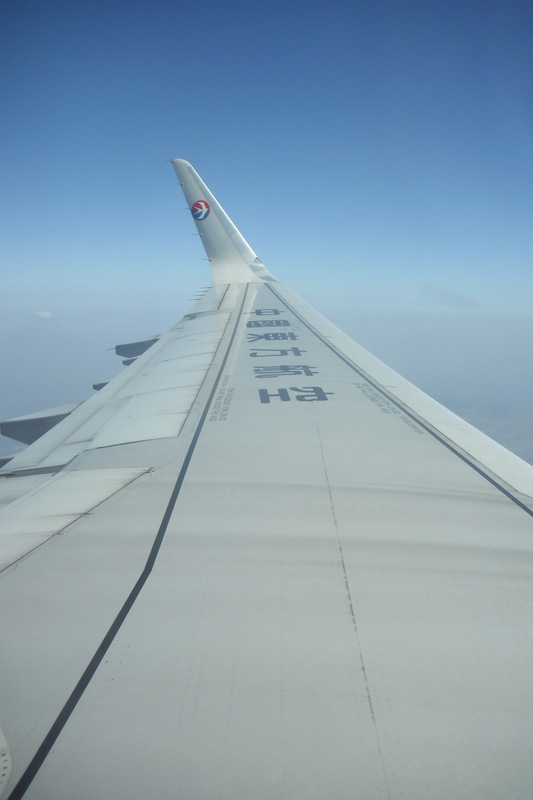 From Beijing, we flew to Xian. 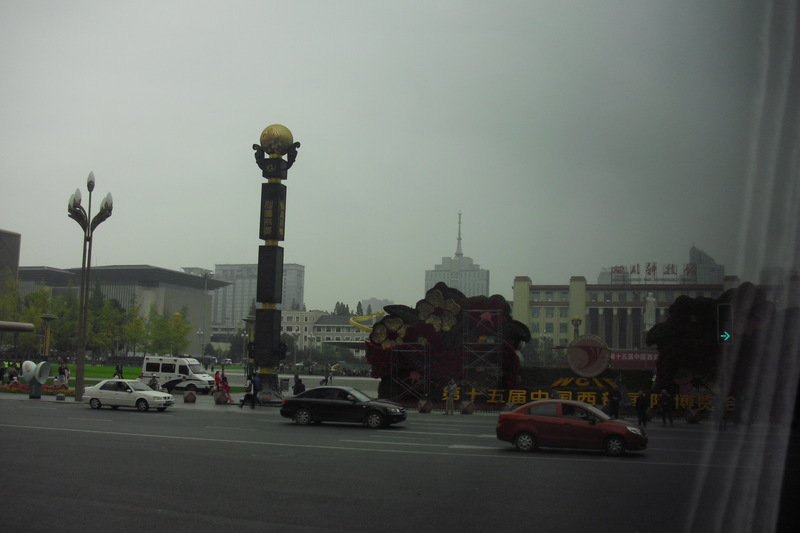 Xian is slightly east of the center of China, and was the original capitol of the country when it was first unified. 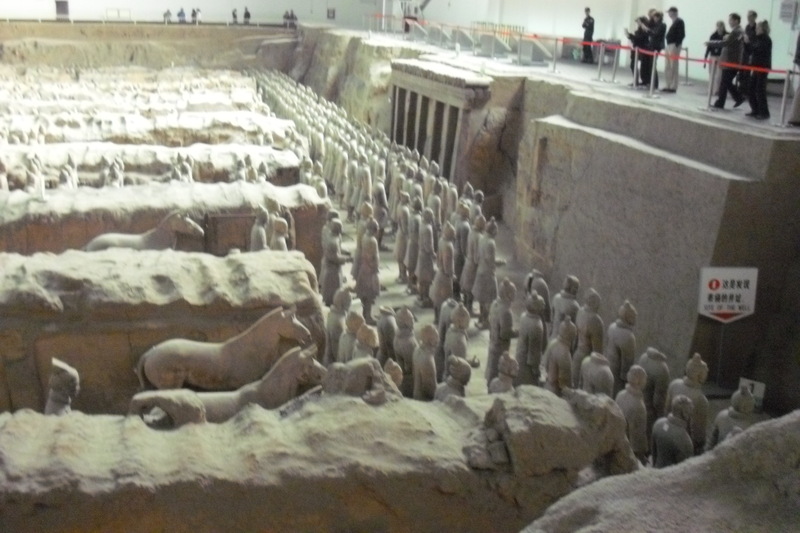 Shi (founder of the Qin dynasty) waWe started our visit by touring the excavation site of the tomb of the emperor Shi Huangdi, the individual who unified the warring states into one nation. 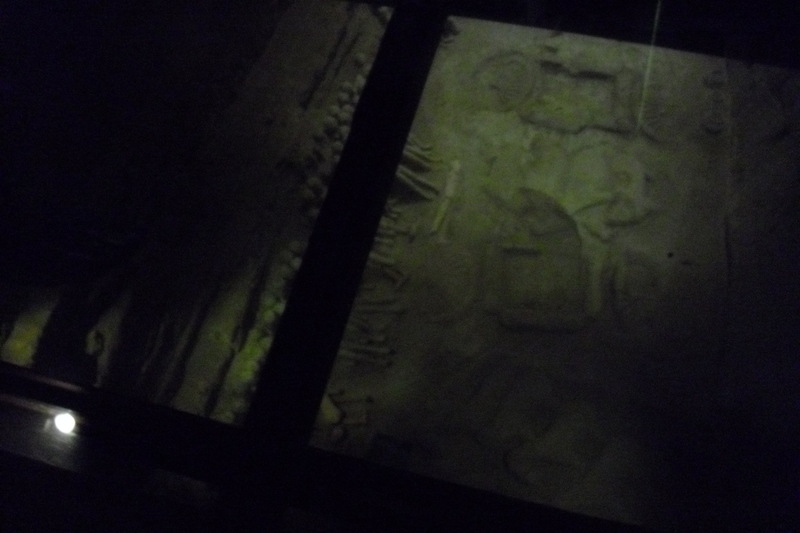 This is a model of the tomb. The real thing is about 30 meters high. 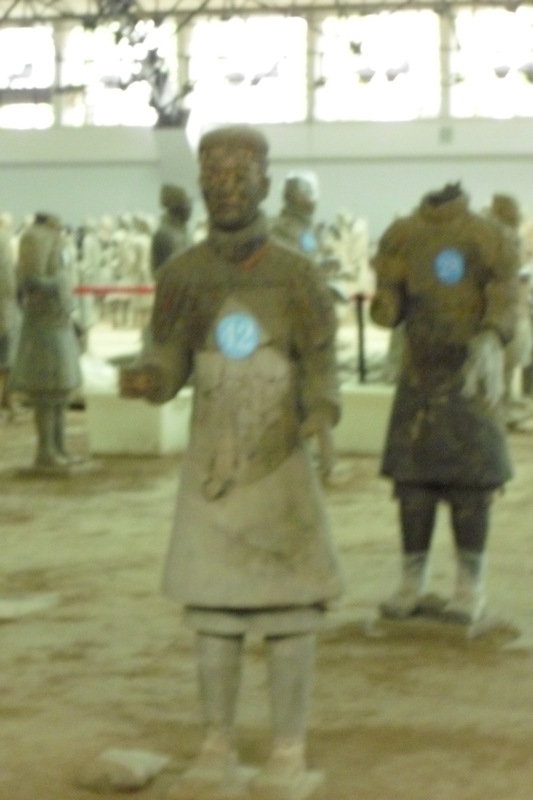 Each of the trenches contains terra cotta statues of various government officials – the longer the trench, the more important the department! Very dark inside and we weren’t allowed to use flash. 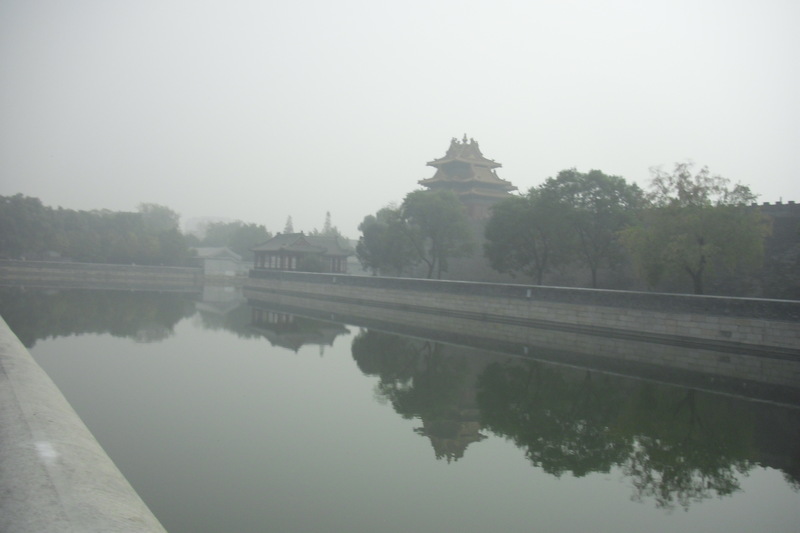 The city of Xian itself is enormous, and surrounded by a huge wall which was eventually extended and formed one of the tributary walls of the Great Wall. Again, to keep the nomads of the North out. 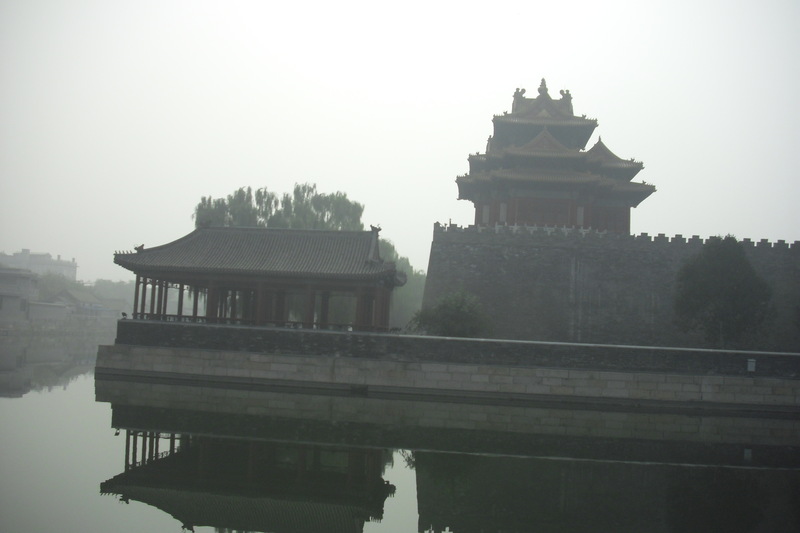 It had long been a practice of the Chinese to build large walls around their cities and towns. 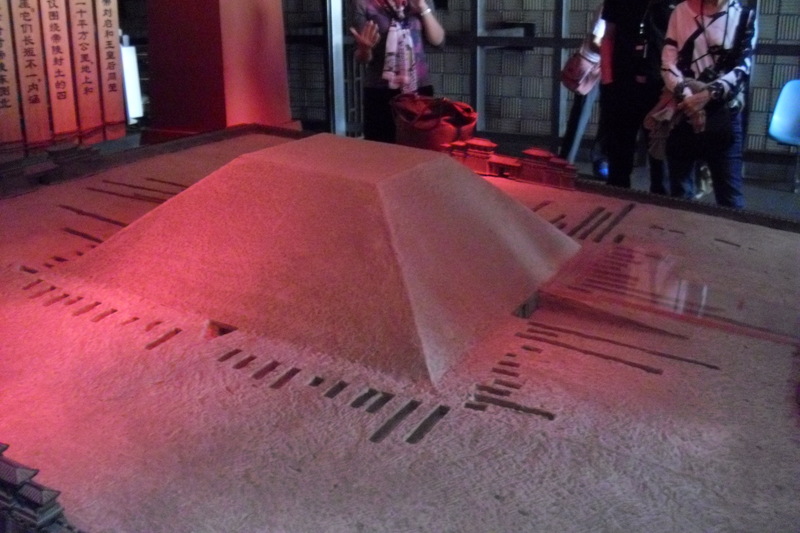 These were normally of rammed earth, soil compacted into surprisingly durable and strong structures. By the 5th century BC, the walls had been extended, primarily as barriers around the various Chinese states, and between the states and barbarian regions. After the unification, the interior walls were no longer necessary, and only the threat from the north remained as the barbarians of the steppes became more organized. 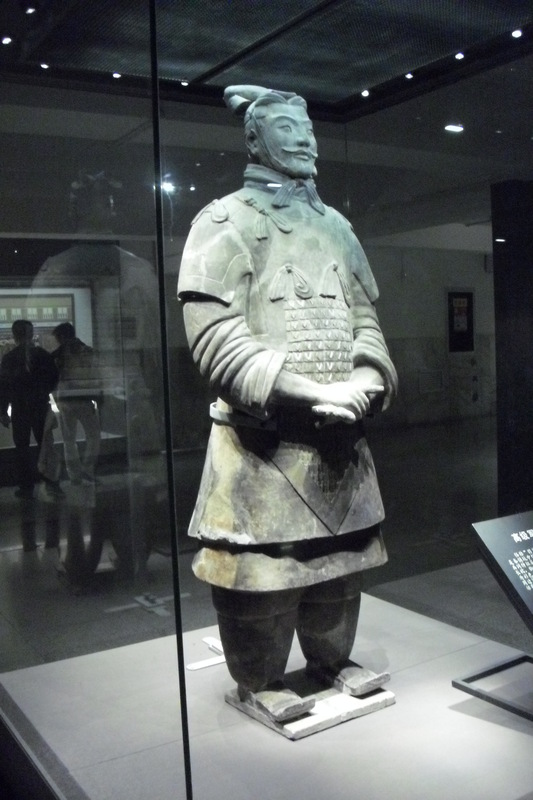 Qin Shi Huangdi linked and connected the existing walls and created the first Great Wall of China, completed in 214BC. 1. In order to make the collection of taxes easier, he standardized weights, measures and money. 2. To reduce the problems of officials travelling from one area to another (in a country with easily 150 different languages) he decreed the use of one language. 3. He standardized the written language. 4. He decreed that all carts and wagons must have axles of the same length. This may seem strange, but consider the road conditions. Roads were rutted and pitted, and if different axle lengths were used, the ruts would reach a stage where the roads were totally unusable. All these reforms encouraged trade, which increased the prosperity of the country. 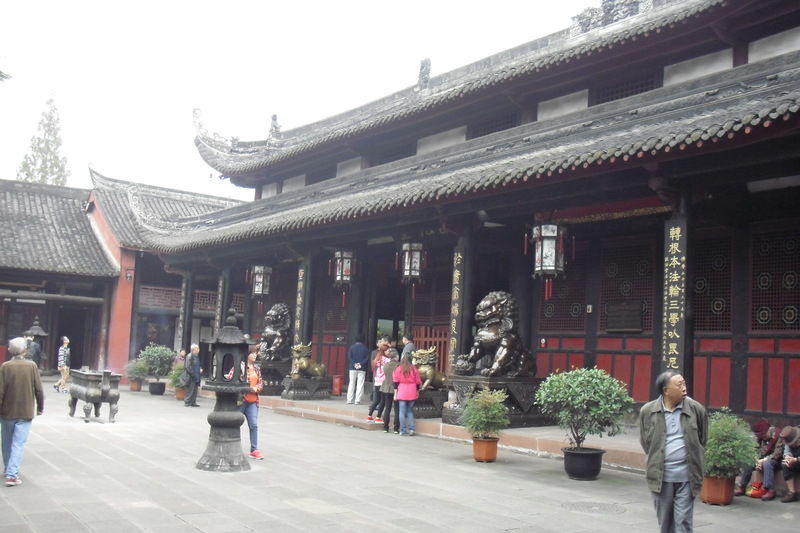 It’s the pavilion where the Emperor entertained his favorite concubine.